We want to post your research cake! 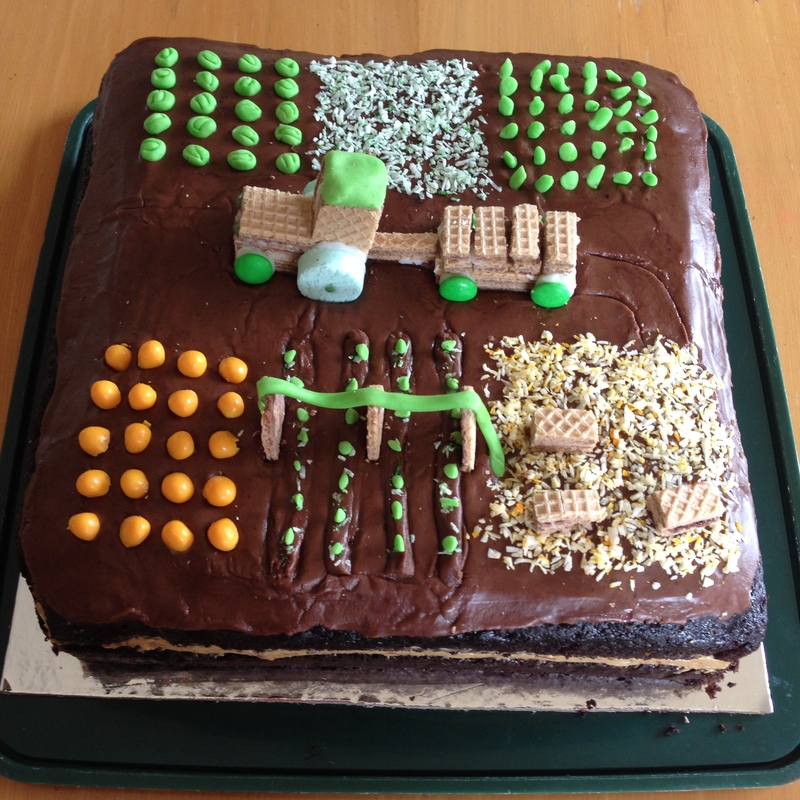 This is a cake looking at the impact of arable rotation on soil health from Craig Anderson (Plant and Food). Moderate tillage (Mm) has a similar impact to no-till on soil health indicators such as microbial biomass, diversity and activity, soil structure and chemistry. These indicators are all lower in intensively tilled treatments. In controls, the presence of permanent plant cover (pasture) has large benefits for all indicators while soil under permanent chemical fallow sees severe declines in soil C, soil structure and biomass with fungal species becoming more prevalent over bacteria. Yellow = straw stubble post-harvest of arable crops with Icing = roughed up to represent tillage intensity. Cake is a chocolate caramel swirl with the amount of ‘swirl’ representing carbon mixing via tillage (or not in the case of PP, PF and Nn). From Anne Wecking describing her MSc journey in Mongolia. “Who would have thought Mongolia to comprise around 8% of boreal forest land? The country’s resources guarantee human survival but have severely been threatened by missing silvicultural management. Until 2016, forest management strategies suggested by foreign development aid were only drawn on above ground forest features. Forest soils hiding below have been overlooked with disregard to their ecosystematic significance. Wildfires trigger pyrogenic organic matter incorporation to the soil. Freeze-thawing dynamics control the soil water household and distinct soddy organic layers serve soil isolation. 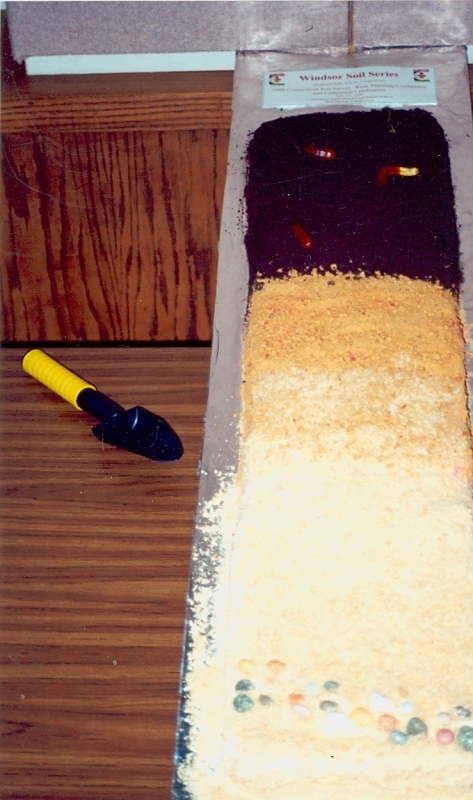 The research cake depicts a Chernic Phaeozem soil that is commonly found at northern exposed foot slopes. Looking like a cylindrical cake by itself, dark fossil topsoil horizons alternate with brighter silt loam material. The order of horizons indicates destructive events to have removed forest cover in the pedogenic past at higher elevation (fire, wind throw, climate variation), followed by slope wash erosion and re-establishment of tree coverage. Whereas geomorphological dynamics are more understood, questions on general soil functioning have remained open, e.g. the plant accessibility of organic nitrogen or the mineralisation rates of pyrogenic organic matter. Further, the soil response to silvicultural measures such as dead wood collection, the removal of forest understorey and changes in tree species composition have yet not been adequately examined. This cake came from Trish Fraser and was made to celebrate the completion of a project supported by MBIE’s Unlocking Curious Minds fund. Their aim was to help children realise that science surrounds them; demonstrate to them just how important science is in their daily lives and increase their interest in science for later in life; and help increase their competency for engaging in scientific issues that challenge our society, possibly even in scientific careers. During the project, teaching resources were provided to teachers of year 7/8 children from 6 schools in the Selwyn District to help the teachers prime their students for a visit to Plant & Food Research, Lincoln. The children spending a morning doing hands on activities, learning about the wide and varied research that goes on to produce potatoes. Later a workshop was held with the teachers to evaluate the impact of the visit and explore ways for the local researchers to engage with schools in the future. Louis’ nephew Jordi graduated and so his sister Danica sent up graduation cupcakes. Note the “W” on the chocolates frogs representing University of Waikato. Jen Cooper’s dissertation compared the water quality renovation functions of different drainfield types, examined mechanisms of nitrogen removal, and evaluated the impact of climate change on contaminant removal. Her cake represents the single-pass sand filter and drainfield of the septic system from which she got effluent for her experiments at the University of Rhode Island, sent to us by supervisor Jose Amador. What a pleasure! 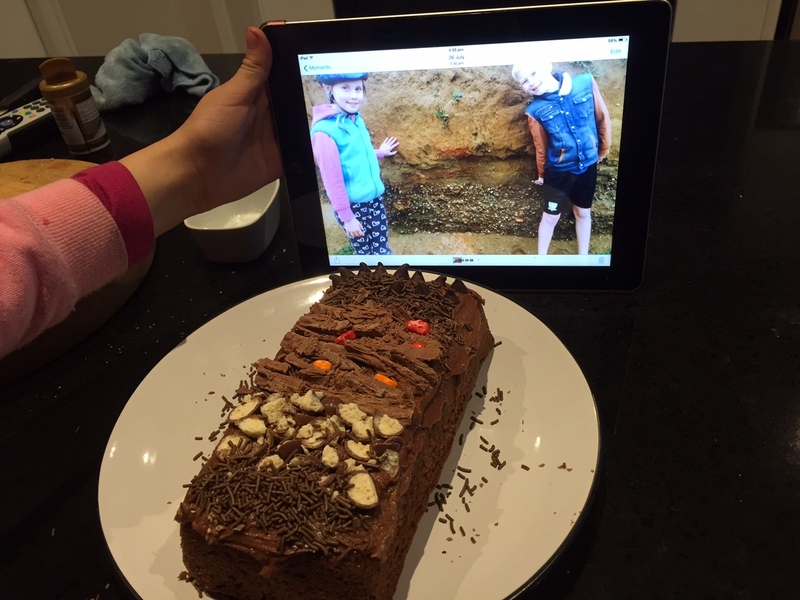 We received this photo of budding new soil scientists who found a complex soil profile, which they converted into a research cake. They describe their work here: “You will remember we did a bit of treasure hunting with some of our friends. We found multi layers of soils and rock. With our mums help we found some different soil scientists who helped explain what the different layers mean. We also found some websites that describe Waikato soil profiles. Some local scientists recommended sites to us too using Mum’s twitter and facebook. Sites we looked at were the New Zealand Soil Data Maps and Soil the world beneath our feet and this site about NZ soils and Waikato ones. The profile of the soil we found looks a lot like the Te Rapa series but we are on the other side of the river.” Awesome work guys and thanks for sharing your photos and adventure! Does NZ have good Soil? At a recent seminar in Wellington, Allan Hewitt, Senior Pedologist at Landcare Research outlined new approaches to measuring soil natural capital and related this to land use decision-making. The audience of policy-makers and scientists enjoyed the seminar – and then to celebrate Christine Harper created a research cake! 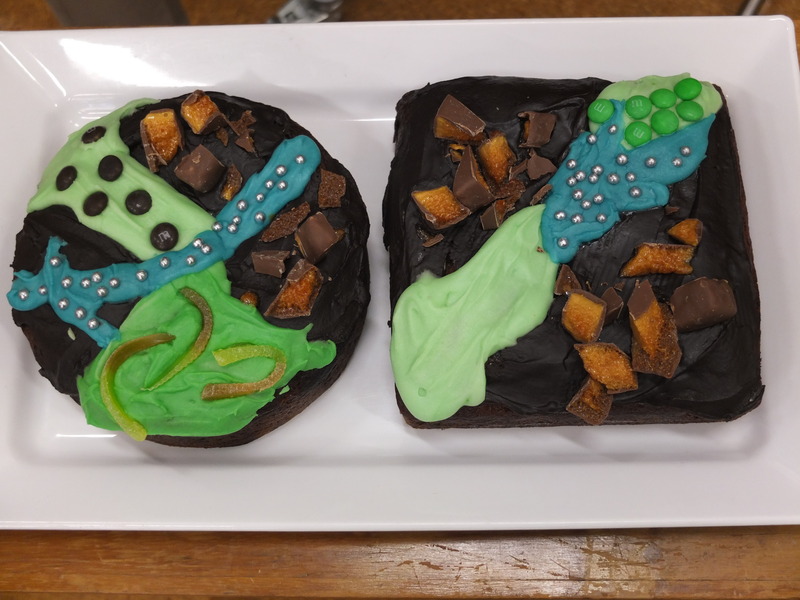 The cake represents soil natural capital (crunched up gold crunchie bars) in the landscape of a sparkling blue lake and river, pasture with cows (brown smarties) and a forest (green smarties). This is the first in a short series of seminars on recent work on soils and land use to celebrate the International Year of Soils. The Windsor series consists of very deep, excessively drained, rapidly permeable soils formed in glacial meltwater sediments. Some areas formed in sand dunes swept by winds from the Connecticut River Valley as ancient glacial Lake Hitchcock receded. The largest acreages of Windsor soils overlie groundwater aquifers of sand and gravel. 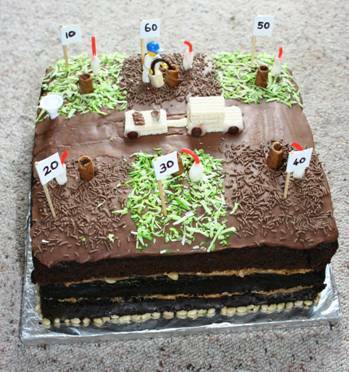 This cake was made to celebrate a colleague Frank Tabley (soil science technician)’s 60th birthday. Frank has spent a lot of his research career conducting field trials including a lot of soil solution sampling (depicted as white tubes with red tube attachments for suction). He has also extracted lysimeters from plots – as shown by the brown chocolate cylinders in each plot. The little man is meant to be Frank doing neutron probe measurements! The mini funnel (white) represents rainfall measurements and the soil is layered with stones (nuts!) at depth. And the truck is pulling a trailer with soil samples on it and looks like it is starting to get stuck in the mud (continuous cultivation!!). The plot numbers are, of course, randomly assigned, one plot representing each decade with suitably vivid flag signs and the largest plot number is for Frank being 60! Frank’s 60th birthday happened to closely coincide with the NZSSS’s 60th anniversary in 2012 so we had a double celebration. The cake above was made to welcome Sustainable Production Portfolio manager, Derek Wilson at the start of Plant & Food Research in early 2009. It depicts Derek sitting atop a mountain (in the Alps) surveying a sustainable NZ landscape (Canterbury) over which he is leading research activities! It shows paddock with different crops, some being cultivated, some arable, some grass with sheep and some with bales of straw and one with an irrigator. There is of course also a farm house, a river, a boat and a few trees. This last cake made by Trish was to welcome her new boss Roger Williams (who took over from Derek Wilson when he retired). 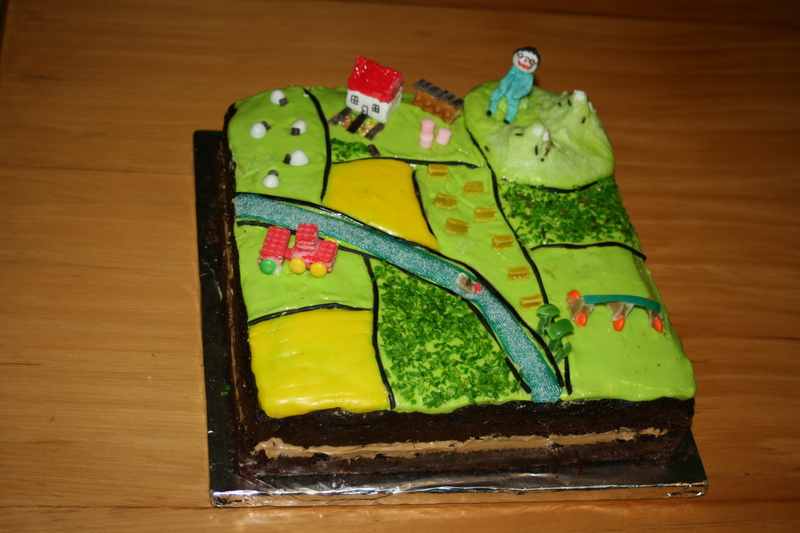 The cake depicts the arable and vegetable industry with a range of crops being grown – e.g. veggies like cabbages and pumpkins, grass seed, arable crops being baled and transported. There are also some potatoes in rows being irrigated by a pivot.